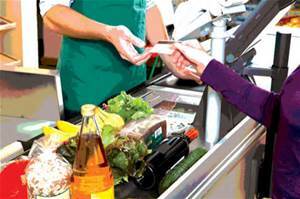 What's your supermarket checkout strategy? Mine's to avoid male cashiers like the plague - they are far less efficient than their opposite number. And as for the express tills, they may mean that the queues are longer, but it can avoid that turgid conversation with the cashier! When you only have a few items in your supermarket basket, joining the 'ten items or less' queue may seem like the speediest option. But in fact, express tills do not offer a faster checkout, according to a study. (They seem to study everything these days!). Instead, your best bet to avoid delays is to queue behind a single shopper with a full trolley. 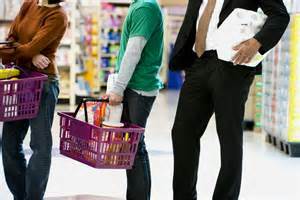 As I've said, when it comes to paying for our groceries, it is the time spent talking to the cashier that causes hold ups and not how many items you are buying. But why is time racked up chatting? I don't want to be impolite, but when the cashier remarks that I seem to be buying a lot of fresh vegetables, I just wish they would cut the chat and concentrate on serving me, rather than try to pass the day in idle gossip about the weather outside or the length of my eyelashes! I've read that the average Briton spends between one and six months of their life standing in line at shops. (Give me my life back, I say!). So what are the other tips to speed your way through the queue? Firstly, choose the till on the left hand side, because most shoppers are right handed so go for the right. Secondly, avoid the less efficient male cashier. Research has shown that it takes 41 seconds for each customer to pass through a till, with an additional three seconds per item they are purchasing. It takes further time to say hello, pay, say goodbye and clear out of the lane. So six people with a small number of items in their basket will take a similar amount of time to two people with full trolleys. Which of your regular supermarkets have the quickest queue times? In my experience, Asda has the longest, while Aldi has the quickest.